On Thursday, December 18, Rachel celebrated her thirtieth birthday. Our lack of motivation to get out of the house dampened our plans to get to the Institute of Contemporary Art (FYI: my motivation will be in full swing when the Shepard Fairey -- of the oh-so-famous Andre the Giant Obey and iconic Obama Hope Poster -- show comes to the ICA on February 6, 2009) , as did an advertisement in the window of a hair salon as we walked from my house to the commuter rail. It was an ad for Ugandan food. "Cool," we said, as we postponed our train ride and walked down Moody Street to Karibu (a must try). After a filling shared plate of Ugandan food (beef stew, beans, rice, yams, sweet potatoes...) we decided it was time for a birthday sweet. Their ice cream is quite good, but not as custardy and rich as I prefer. In all honesty, I have a palette that prefers the sweetest, richest ice cream...Not that I would not go to Lizzy's again. It's good stuff, even if it isn't as custardy as my most favorite ice creams. 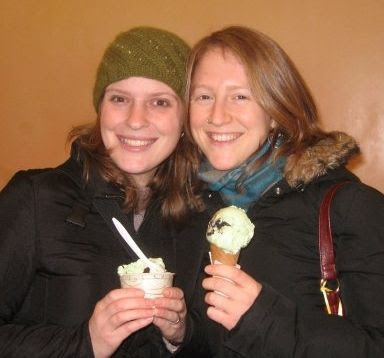 Rachel and I both had Mint Oreo ice cream -- yum. This is way up there with my Mint Girl Scout Cookie Ice Cream -- actually, it is very similar, except theirs uses Oreos instead of Thin Mints. I should post this recipe for my Mint Girl Scout, which is a variation from a recipe in the Ben and Jerry's Homemade Ice Cream and Dessert Book. Rachel had a cone, which as Tina notes, is a much better way to take in the flavor than the bowl that I had. Either way, the ice cream was good and neither of us minded the subfreezing temperatures outside while we were inside eating our frozen goodness. I am coming on years here in Boston, and now I can say I am about 1/3 a Boston Girl, and 2/3 a Connecticut Girl -- I have spent a third of my life up in the Boston area. That being said, it's time for me to admit my leaning towards all things Boston (Growing up in Central Connecticut, we had to decide Yankees versus Sox, Giants versus Pats, and Knicks versus Celtics -- not being much of a sports fan, I never really chose.) However, I have to say, I am truly a Boston Girl (that's right, Pushstars, that song just might be about me. I find myself caring about how the Sox or the Celtics are doing. I can't say so much for the Pats, as (the horror) I have never understood football. I ♥ hockey though, so I do have to say the Bruins are second only to Hartford's one and only (and now defunct) pro team, the Hartford Whalers (once a Connecticutian, always a Connecticutian). Back on topic. 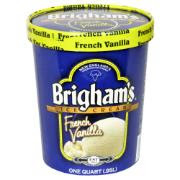 Now that I am a Boston Girl (or 1/3 anyway) another thing I ♥ that "I can call my own" (another Pushstars' Boston Girl reference) is Brigham's Ice Cream. I once wrote Brigham's in my sadness over the death of their Fluffernutter Ice Cream. So sad, in fact, that I had to make my own recipe for it. Yes, which I should post, and I will, I promise (though, long story short -- vanilla base, with peanut butter and Fluff -- along with the Somerville Illuminations Tour, Fluff is one of the best things to come out of Somerville -- swirled in). Last month, we were supposed to have the lovely Clint, Stacey, and Ivy over for dinner. At the last minute, Ivy got sick, and our plans got canceled. Good news is, she seems to better, bad news is, we never rescheduled, and I found a new obsession. I had intended to bake (because I love to) but time ran short and I picked up a Vermont Mystic Pie Company pie (by the way, these are so much less expensive at Costco than the grocery store -- when I saw the reciept, I realized a fresh bakery pie would have been the way to go -- but alas, now we have a frozen pie that is actually quite good once cooked in the oven for a surprise visitor) and a container of Brigham's French Vanilla Ice Cream. A few days after the canceled visitors, in a moment of sweet tooth weakness, I made the huge error of opening the carton. I dipped my spoon in and...WOW. On first bite, I knew this would be a problem. This ice cream was so rich, so creamy...it was the treu definition of frozen custard. It literally was creme brulee without the brulee, poured into an ice cream machine and churned. Oh. My. God. I love custard based ice cream (made with eggs as opposed to the Philadelphia style which has no eggs) so naturally I was in heaven, but to me, this was so much more. It was just the right amount of sweetness and egginess (I don't know if this sounds like such a great way to describe ice cream, but if you like custard based ice cream, you will know what I mean). Anyway, long story short: I am a fan of Brigham's. Especially this French Vanilla. It alone makes living in the Boston area well worth it. Stay tuned for an upcoming list of why the Boston area is a great place for ice cream lovers. Holidays stressing you out? I found some sweet treats on Etsy to calm for this holiday season. It might be a little late to order as a holiday gift (but contact the sellers to be sure) but are a perfect new year treat! Since we are all busy, I am keeping the list short, but as always, sweet. I was first inspired to write this post when I saw a listing for CrazyKBathandBody's Waffle Bowl Ice Cream Goats Milk Soap, but just visiting her site for the link, I also see she makes an Ice Cream Sandwich soap and some super cute Hostess Cupcake looking soaps (which is so real looking it seems that the seller's mom almost ate it!) Funny, I said these would be great pampering products, but I don't know if I could actually use these beauties, as they are so sculptural. At under six dollars and over three hundred scents to choose from, these soaps are a steal! Next up we have something perhaps only a pregnant lady could love -- but boy would she love it! 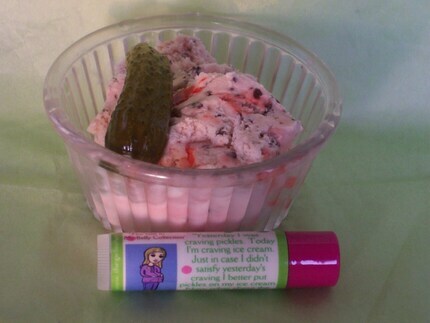 Elladean sells, get this, Pickles and Ice Cream Vegan Soothing Lip Conditioner for Moms to Be. I don't know if I could actually buy and wear this (but then again, I am not pregnant) but I am so amused by her darling illustrations and illustrative photos and the quirky text on the packaging (visit the listing to see that!) that it seems worth the $3.25 to try it out...Has anyone ever tried pickles and ice cream? Or pickle ice cream? Please do write us and tell us your opinions. 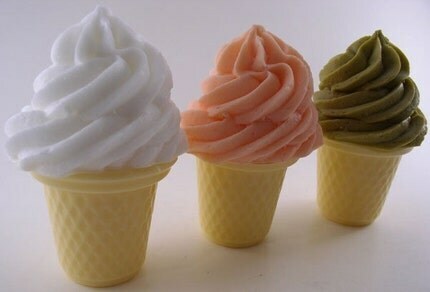 And last but not least, we have perfect Ice Cream Cone Handmade Soap by SoapStore. SoapStore's shop is totally worth checking out, as her food soaps are so realistic looking. At $4.50, these are so on the list of prizes for next year's ice cream party -- my only trouble? -- picking among the many colors and flavors! My one sweet wish -- not SoapStore's fault -- is that shipping didn't have to be so high. Have a clean and sweet holiday! Got an ice cream lover on your Christmas list? 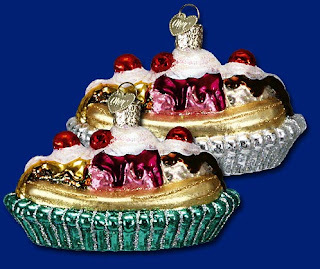 They'll love one of these fun ice cream inspired ornaments to hang on their tree every year or check out the fun crafty do-it-yourself ice cream cone ornament. 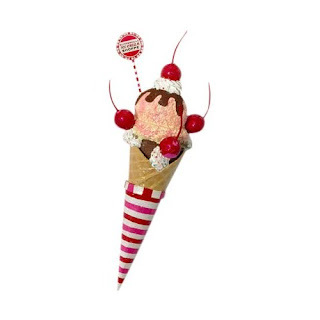 Sweet treats on your xmas tree made with a real sugar cones that kids will love to help make. 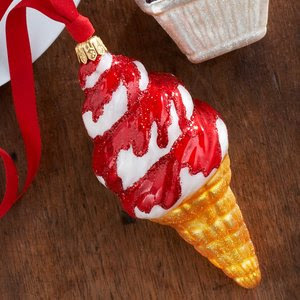 Glue a 3-4" diameter red satin ball ornament to a sugar cone. Add cotton balls around space between cone and ball with glue. Add cotton to top of ornament ro represent whipped cream. Let dry. Call it a sign of the economic times, but I find that most of my recipes lately consist of leftovers or pantry items that I try to stretch as far as possible. This ice cream was no different.... and surprisingly led to great tasting results. Trying to rid myself of at least a few of the dozens of frozen bananas I have in the freezer, I decided to make banana ice cream. When making banana ice cream it's actually very important to use bananas that have been previously frozen (I could go into an Alton Brown like spiel here but lets just say it has to do with the formation of ice crystals and move on). I wanted to add some oomph to the banana with spices because, well, I love spice ice cream so I added ginger and then one upped the spice factor with a few crumbled ginger snaps I had sitting in the pantry. This is a surprisingly rich, creamy and decadent ice cream that also happens to be pretty easy to put together! Enjoy. Warm the milk, sugar and ginger in a saucepan. When sugar is dissolved, remove from heat. Pour cream into a bowl and set a strainer on top of the bowl. In another bowl, whisk yolks. Add a few tbsp's of the milk to the yolks and whisk. Slowly add rest of the milk while whisking constantly. Pour mixture back into saucepan. Heat on medium. Stir the mixture with a wooden spoon, until mixture thickens and coats the spoon. Be sure to stir constantly so eggs don't harden. Pour the mixture, through the strainer, into the cream. Stir in well mushed banana and vanilla. (For a smoother texture, blend in blender). Cool over ice, then put in the fridge to cool completely. When cold, freeze in ice cream mixer (according to directions). 5 minutes before finished, add cookie pieces. If soft, ripen in the freezer for a few hours. P.S. Check out SpiceDish's site for some "Rubberized Awesomeness" -- totally up our alley. Really, this is rated G, people (as my friend Ashu would say). It wasn't so much that it had an exciting ending that I wanted to finish it, but more because I wanted to check it off my list. I thought the history was interesting, but it wasn't particularly a book that I just couldn't put down. The other reason I may not have been so into it is as a general rule of thumb, I am an ice cream girl more so than a sundae girl. I mean, a good sundae will never be turned down, but for me, it's all about the base -- the cold, creamy, sweet resting place for all the toppings. Putman Pantry in Danvers, MA. Why? It's nearby, and I can't believe our dear friend Spaghetti never told us about it! Guess T and I will have to meet him up there for sundaes someday soon. For those of you that doen't know Spaghetti, it's still worth the trip, as Turback descibes the "fourteen foot, stainless steel sundae bar as an anti salad bar." I'm so there. Serendipity 3. But then again, that's been on my list for a long time. Ashu, next time I visit you, we are SO there. If it's still there, can we sit at Andy Warhol's table? 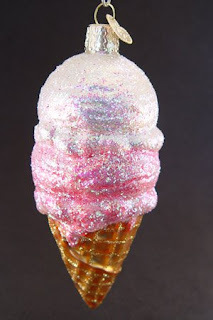 By the way, I happened to come across this article I missed when I wrote about the World's Most Expensive Sundae at Serendipity 3 back in July. With it are pictures and all! Shark and Rose, in San Jose, CA. Do you know the way to San Jose? I don't but I am sure to figure it out next time I am in California, so I can see what all the fuss is about their Soup Spoon Sundae. Is this little sundae enough, or does it leave one begging for more? My biggest problem with the book was the design. And I am not just saying this as a designer. The book was designed in pink and black, which I think is very appropriate for a book on ice cream. However, the typefaces chosen were awful. I understand where the designers were coming from, wanting typefaces that were fluffy and ice cream-like, but they were so fluffy they were practically illegible. The body text was a swirly serif that should not be used for so much writing. It makes ones eyes tired because it really has to study each word rather than read in a flowing manner. The little pink box notes were even worse: they were written in a cursive script. This is not suitable for reading a paragraph of type. The worst were the capital "S"s -- they kind of looked like "T"s or "J"s.
Ok, so here's the embarrassing part. I never remember what I read, so writing this little review here has been a little hard since I finished the book on October 20th. So here i am looking back to see what parts of the book stood out to me, and alas, I come across the Inside-Out Sundae. Where can I find it, I ask? Oh, Minnesota. I was in Minnesota last week. But Minnesota is a big state so I probably wasn't anywhere nearby. Oh, it's served at the Green Mill. Oh, the Green Mill that we ate at last week?! Yep, if I could remember what I read, I sure would be better off -- I could have been reviewing the Inside-Out Sundae in person! All things considered, people define what makes a sundae very differently. Does it have to have nuts? Syrup? A cherry? 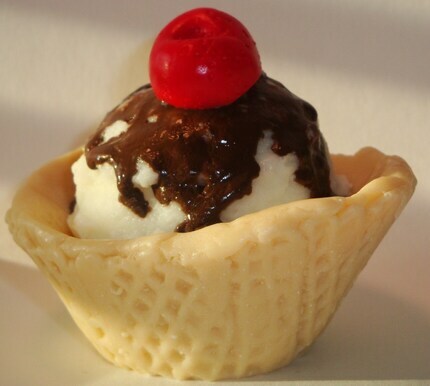 One thing is for certain, a sundae has ice cream, and here at Scoopalicious, that's all we think that counts!